Frown lines can make you look older and stern. They are caused by small muscles between your eyebrows and in your forehead, an area called the glabella. Frowning and squinting contract those muscles, almost as if you are deliberately exercising them. Regular massage can relax and smooth those muscles, preventing frown lines and giving you a more relaxed appearance. Spread grape seed oil or moisturizing cream over your face. Concentrate on the glabellar area. Using the middle finger of each hand, massage the nose, between the eyebrows and across the forehead in little circles. Use light to medium pressure, focusing on smoothing and relaxing the skin. Press the middle finger of each hand into the bony ridge between the eyebrows. Drop your head so that the weight of your head presses onto your fingertips. Maintaining the pressure, stroke very slowly from the glabella up into your hairline. Repeat this stroke two or three times. Press the middle finger of each hand into the glabella, between the eyebrows. Drop the weight of your head onto your fingertips. This time, stroke sideways from the glabella out over the eyebrows, trying to stretch the muscle tissue beneath the skin. Repeat this move two or three times. Rest your fingertips on your eyebrows. Let the weight of your head drop onto your fingertips. Stroke with medium pressure from your eyebrows all the way up into your hairline. Repeat this move two or three times. Press the middle finger of each hand into the thickest part of your eyebrows, next to the glabella. Massage in slow circles. Pay attention to how the tiny muscles under the skin feel. When they are relaxed, you can't really find them unless they are overdeveloped. Then frown and feel them tighten. That helps you identify the specific spots you need to work on. Press on the little muscle bulges. Stretch them upward and outward from your nose. Look at a picture of the glabellar muscles, the procerus, corrugator supercilii and depressore supercilii, so that you see the direction of the muscle fibers. Stretch the little muscles along the length of the muscle fibers. Massage should not be painful. Don't press so hard that you bruise yourself or cause a headache. These are small muscles; they don't need intense pressure. 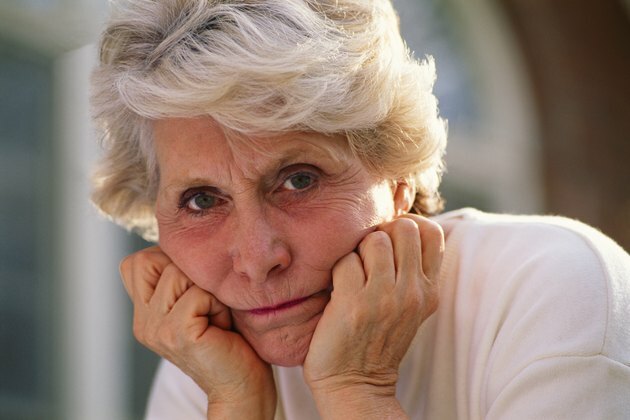 Can Facial Exercises Improve Frown Lines? Is It Possible to Grow Your Eyebrows Thicker With Castor Oil?